As we get back into the swing of things, we’ll start with a quick trip back to the biggest event of 2014, the International Photobooth Convention in Chicago. In addition to our own recap of the weekend’s festivities, we had some great recaps from Matt at Photo‐Matica, Tony DeFrank (who came all the way out from California), and an amazingly detailed and thoughtful wrap‐up from Meags Fitzgerald. Thanks, everyone! Since the convention, we’ve had an incredible list of new booth locations to add to the site, from six countries on three continents. I can’t remember the last time we had such a varied and interesting set of contributions. Thanks again to our readers for continuing to document these booths so faithfully. 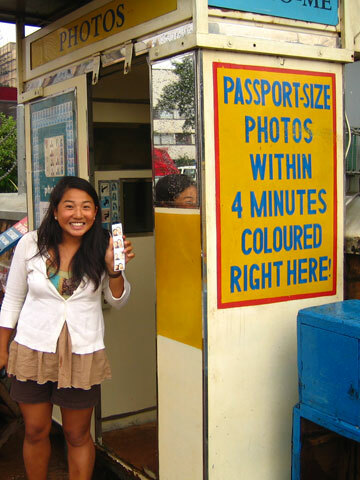 We’ll start with a real surprise, our first ever photobooth located on the continent of Africa! Thanks to a conversation we had at the convention, Steph sent me photos and info about the booth, located in the center of Kampala, Uganda, which she had visited in 2007. We’re not certain it’s still there, but either way, we’re happy to have the booth listed in our directory. In other news of new booths, we heard from Alexander Spevak, who let us know about the first booth we have listed in the Czech Republic. The black and white booth is located at the Kino Světozor, and a strip will set you back 50 koruna. And just this week, thanks to an email from Stefan of Photoautomat Amsterdam, we’re elated to be able to add a photochemical photobooth location along the Herengracht canal in lovely Amsterdam. 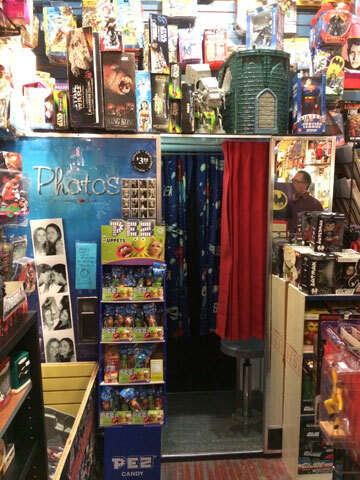 The booth is located at the Lomography Store, and takes euro coins and custom tokens — nice! Our thanks go out as well to Matteo of Fotoautomatica, who has informed us of a new black and white booth location at Borgo Burger in Livorno, Italy, bringing their total to five machines around the country. Swinging back across the Atlantic, we have a new location in Canada, doing its part to turn the tide of booth closures across the country, a black and white booth at the Cobalt Motor Hotel in Vancouver. And finally, a few new locations in the U.S. First, thanks to Connie Begg for sending us info and photos about the booth at Heebe Jeebe in Petaluma, California, right before the convention. Tony let us know about a photobooth at Big Fun in Columbus, Ohio, which follows along in the Big Fun tradition of very nearly burying their photobooths amongst the products available for sale. 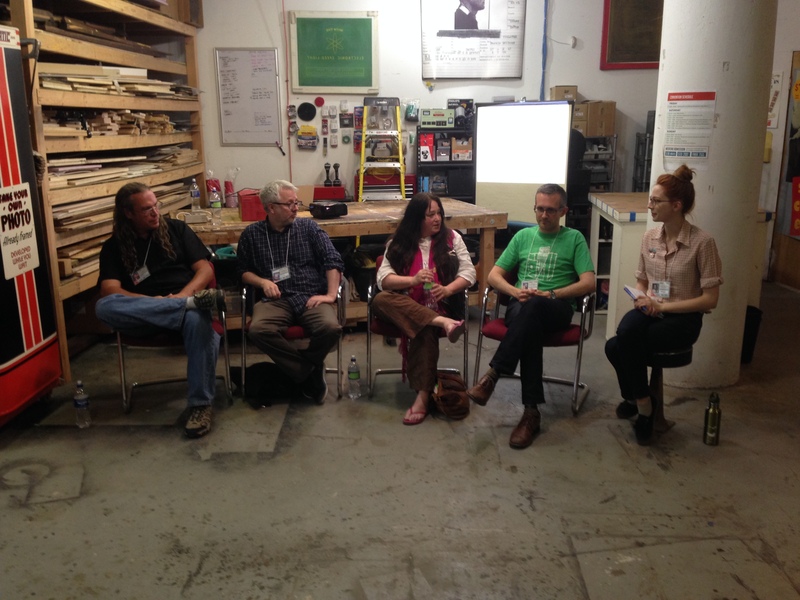 As it turns out, the booth at the Ace L.A. is actually the machine that used to be located at their Portland outpost; can anyone confirm that the Ace Portland has another booth, or has it become a booth‐less Ace? Staying in Portland, we’d like to finally thank our convention buddy Kory for contributing photos and info from a black and white booth at Dot’s Cafe, with its lovely polka dot back curtain. 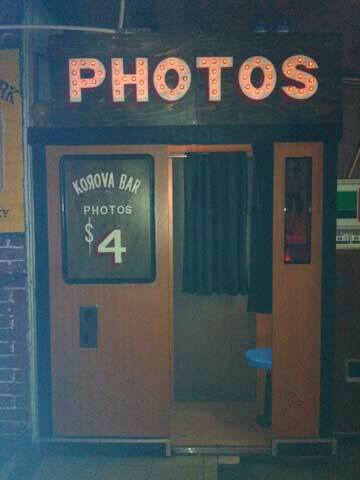 And finally, thanks to Nathan for letting us know about the black and white booth at Montana, a bar in Seattle. Especially in busy photobooth cities like Portland and Seattle, locations are always coming and going, so we rely on our readers to keep us posted. Thanks again, everyone, and keep the emails coming! We’ll be back next week with another update recap from the summer. As I prepare for the 2014 Photobooth Convention and my talk about the history of the photobooth in film, I’ve been adding some updates to our Movies & TV listings. It’s been awhile since we made a count, and at this point, we now have more than 325 films and televisions shows listed, each one containing a photobooth or a photostrip. Of the 180 films and 146 TV shows, two‐thirds of them were released in the last ten years, which is probably more of a result of our having paid attention over those years (and the films being readily available) than any kind of photobooth resurgence. I’m still on the lookout for more films and TV shows from the golden age of photobooths, in the ‘60s, ‘70s, and ‘80s, and I’m always excited when we get a tip about one, like we did for In God We Tru$t. Thanks, Charles! On the somewhat less interesting side of things — but hey, we’re completists — we have a brief appearance by a photostrip in Ghost Rider, starring Nicolas Cage and Eva Mendes. Thanks to Les Matons for letting us know about this one. And finally, from a film not even released yet, we have a brief glimpse of a photostrip on a freezer door in the trailer for Joe Swanberg’s upcoming Happy Christmas. For more on photobooths in cinema, as well as talks, workshops, and all the free photobooths you could ever want, come to the convention in Chicago next weekend! We hope to see you there. We’re fresh off another planning meeting for the 2014 International Photobooth Convention, and we’re excited about the plans that are coming together. We’ve got a host of workshops, talks, screenings, and other events lined up, and we’ll be making some more concrete announcements in the coming weeks. In the meantime, a few things: first, for those of you who haven’t attended one of the previous conventions, we encourage you to check out the recaps and photos from past events here. The term “convention” is used in the loosest possible manner; in fact, it’s downright misleading if you’re expecting vendor booths, name tags, and schwag. Well, there may be some schwag, but it won’t be branded flashlight pens and business card holders. The International Photobooth Convention is an occasion for enthusiasts, artists, photographers, collectors, and the otherwise intrigued to get together and celebrate the wonder that is the photochemical photobooth. We take photos, engage in collaborative projects, share tips, give talks, play games, make art, and have a great time. Bring your friends, bring your kids, but leave the business plans and stock tips at home. We’ll close with a shot from inside our host venue, the amazing A & A Studios in Chicago. We can’t wait to see you all there in June. If you’re coming, let us know on the Convention’s Facebook page, and get in touch if you have any questions. We are very excited to announce that the 2014 International Photobooth Convention will be held at A&A Studios Chicago, June 6–8, 2014. Organized by our longtime friend and collaborator (and designer of the convention announcement) Meags Fitzgerald, yours truly Tim and Brian, and Anthony Vizzari of A&A Studios and host of the 2009 Convention in Chicago, the event will bring together photobooth enthusiasts, artists, experts, and the generally curious for a weekend of experimentation, collaborative projects, talks, screenings, and a book launch. Visit the convention page and RSVP for the event on Facebook. More details to come in 2014. We look forward to seeing you all there! We have a few updates today as we head into fall. Thanks to Brad for letting us know about his Model 14, rescued from near‐death in Wisconsin and restored by Brad with help from Anthony at A&A Studios Chicago, now up and running at The Junction Diner in Forest Park. Thanks to our Canadian correspondent Meags Fitzgerald for another update from our northern neighbors. First, two booths we haven’t had listed before in Montréal: first, at Korova Bar, a color machine with a customized cabinet. And second, another one of the many booths in the Montréal Metro, this one at the Sherbrooke Metro station. Secondly, we have some belated news about Meags’ stop‐motion photobooth short film, LaCuna, which screened last week at the Edmonton Film Festival, and won! Congratulations to Meags for her film being named Best Animated Short film. I apologize for being late to the game on this momentous news; if I had my way, I’d be live‐tweeting and up‐to‐the‐minute blogging on all sorts of photobooth news, all day long, but it’s been a busy summer and fall, and it seems like keeping up with the news was the first casualty. I have to say, though, as things begin to calm down during winter, we have a lot of interesting stuff coming up, and 2014 promises to be another big year on the photobooth front. Thanks to Tim Mantoani, a photographer in San Diego who owns a lovely Model 9 photobooth which we visited in 2008, for letting us know about his newest venture, Snap Apparel. This photography‐themed clothing shop includes a shirt featuring his booth, so if you can’t visit the machine, you can at least carry a picture of it around with you. Thanks also to Les Matons for another gem of a find, an extended sequence in a photobooth from a 1982 film starring one of my favorite French actors, Lino Ventura, called Espion, lève toi. Check out more stills from this sequence in a Swiss Prontophot booth in our Movies section. Keep your contributions coming, everyone!